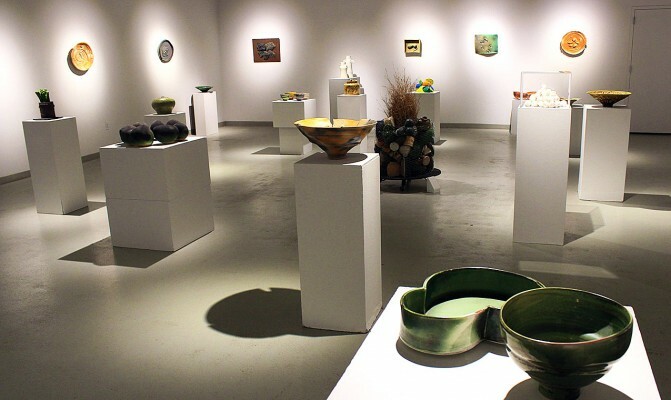 There are funny shapes and objects all over Clay Odyssey: A Retrospective, a survey of work at the Birmingham Bloomfield Art Center by ceramicist Marie Woo, spanning a 60-year career that has always aspired to push ceramics past function and into experimental realms. There is not a symmetrical form among the 50+ works on display. There are stacks of thin, rigid forms, peaked like high hats from drum kits, rendered in matte clay and punctuated with little nubbins. There are collections of forms that look like hot stones under dilapidated and rusting wire enclosures—like the contents of a charcoal pit, or the steam-producing unit in a sauna. 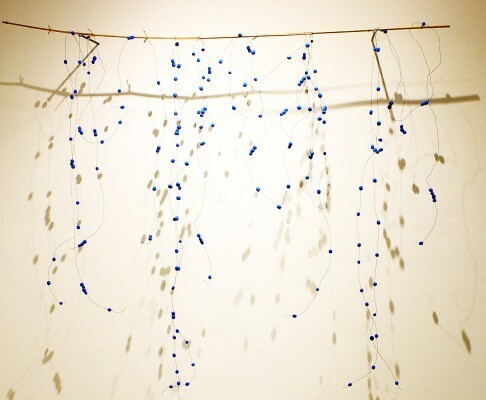 A delicate branch suspends a collection of azure clay beads on lengths of wire in a static, freeform arrangement that resembles a frozen rainstorm. Inside a rectangle of glass sits a loose pyramid of lumpen white balls. Irregular wall pieces suggest nests containing clutches of dinosaur eggs. The majority of pieces are finished in chalky, matte glazes that give the room a sense of antiquity. Everywhere are shapes of prehistory, primordial roots. 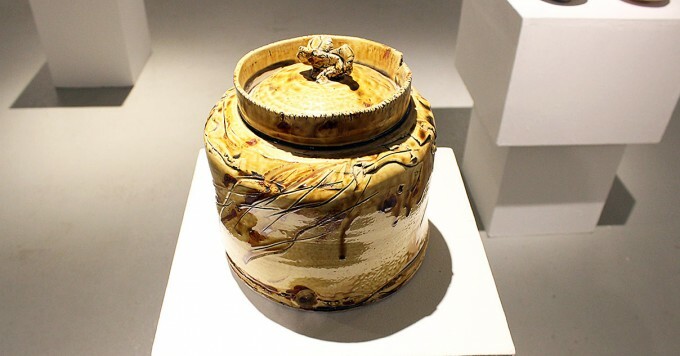 There is great intentionality in the way that Woo has slashed and broken her forms – even those resembling traditional vessels have scarred-over cuts along their exterior surfaces, strategic tears and gouges, or oddly pinched handles on the lids of pots. 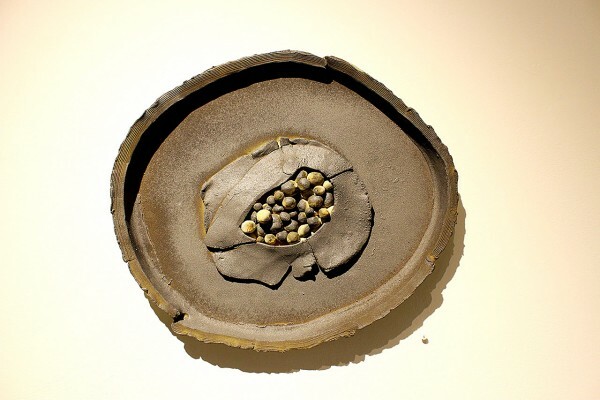 Based on Woo’s background, studying under famed ceramic artist Maja Grotell, founder of the ceramics program Cranbrook Academy of Arts—as well as her subsequent involvement in the experimental ceramics collective, the Clay Ten, and her fervid dedication to researching and preserving the traditions of Chinese folk pottery, that Woo understands how to make a flawless form. The question then becomes, why does she so categorically refuse to do so? Perfectionism can be a real mind trap. Training on the pottery wheel demands precision, symmetry, replicability of form. And yet, in a world where perfect bowls, mugs, and plates can be created by machine and readily purchased at the local Crate & Barrel, that there is little practical need for a ceramic artist to focus on making functional or “perfect” forms. 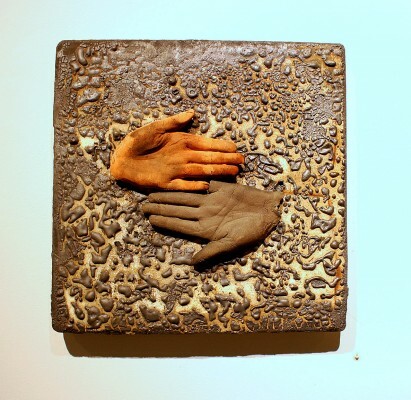 Rather, Woo seems to be obsessed with the hand of the artist as a reflection of her own capacity for human error and variance—there are literal castings of (presumably) her own hands in several wall pieces. As is aptly demonstrated by the recent group show at Pewabic curated by Cranbrook’s Head of Ceramics, Anders Ruhwald, This is the Living Vessel: person. This is what matters. This is our universe , there is an opportunity to treat ceramic vessels as an expression of the individuality of their maker—of all people, as living vessels. This seems to be at play in Woo’s oeuvre. 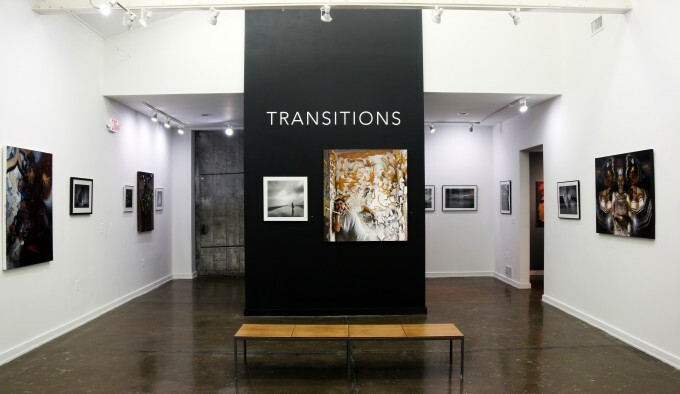 Galerie Camille’s current show features the work of two artists at two very different points in their careers- Brian Day, an established Detroit area photographer, and William Harris, a painter and former student at College for Creative Studies. At first glance, the two couldn’t be more different, stylistically, technically, or conceptually. That is part of the point, says Melannie Chard, director of Galerie Camille, a recent addition to Midtown’s mushrooming gallery district. 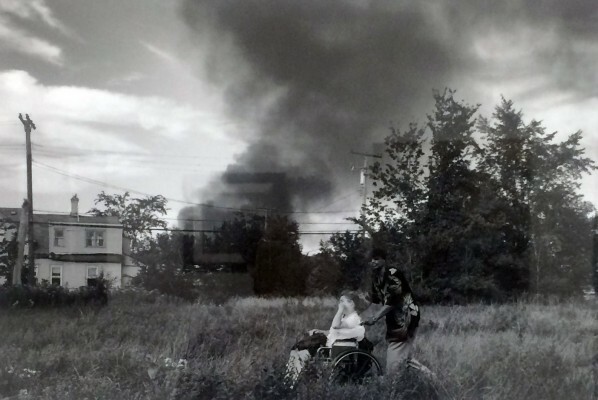 “It is actually my intention to continue to exhibit established artists with newer artists, and you will see this theme in upcoming shows as well… I like that it provides an opportunity to introduce collectors to new work, and the artists seem to enjoy the collaboration which ultimately strengthens the artistic community.” Chard’s conviction that there is room for everybody in Detroit’s exhibition roster, and her commitment to showcasing new and potentially risky work, is welcome news that immediately sets Galerie Camille apart in a scene that can feel insular and difficult to gain exposure in. The work of Day and Harris shown side by side is proof that Chard’s formula is potent. In nearly every respect, Harris is the Appletini to Day’s Grey Goose, neat- both get you there, via different styles, materials, and combinations. Both, however, derive from the same culture, and are hunting down the same distillation- the human figure as it inhabits, symbolizes, and claims its stake in iconic architectural structure. 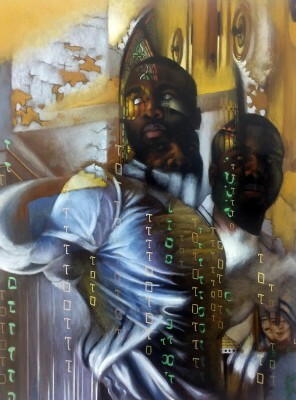 Harris is a hitherto self-taught painter whose style is in a state of fraught transition, as it becomes overlaid with academic techniques and compositional tropes. His work, at this point, maintains an ardent, romantic floridity and an endearing improvisational use of materials that speaks both to his naiveté and his sincerity. His subject matter involves various experiments in dissolving figural repetitions into cavernous architectural spaces, drawing imagery from Surrealism, documentary images of derelict architectural spaces, and what I can only define as a romantic music video aesthetic. His technique and subject matter are still finding their way- his rendering of hands is particularly problematic, especially juxtaposed with his incredible facility with faces, and eyes in particular- his figures manage to be both iconic of the structures they are overlaid onto, and autonomous characters in their own right, who engage the viewer, from one piece to the next, with an unsettlingly steady, appraising return gaze. Harris’ technical foibles would be less distracting if they were more intentional and canny- which might, ironically, throw off the crystalline sincerity of his work. Day, by stark contrast, is a mature artist in full command of his powers. His photographs are fluent masterworks, each finding a balance between content and form that evokes the early Constructivist photography of Alexander Rodchenko. Like Rodchenko, Day grounds his work in a deceptively straightforward, documentary style that speaks simultaneously in a more subversive formal language, conjuring gorgeous abstractions in light and shadow even while capturing candid moments of human passage through urban space. 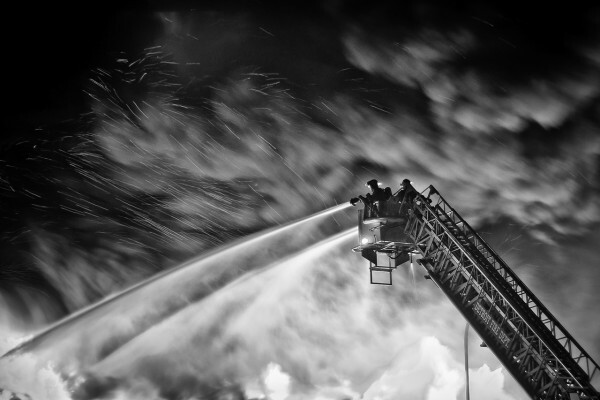 Day’s documents of action, while political in their content (his body of work “Planet Detroit” depicts the ravages of house fires in run-down neighborhoods, seen up close as fire fighters battle with them, or at a distance, as grim vertical plumes of smoke rise against a scene of daily urban transit) dwell in the formal beauty of these arrangements of light and shadow as well, with a lightness of touch that offsets the potential for objectification that lurks in his subject matter- Day is able to see both horror and beauty from ground level. The two artists share an interest in the vital role human action plays in the life of architecture, and, in turn, how the narrative of that architecture informs the culture that inhabits it- the embattled maintenance and slow decay of the structures that define our landscape becomes part of our viscera, as well as the scenery of our daily movements. It will be interesting to see where Harris takes his exploration of the figure’s physical and metaphorical weaving into structures. The formal lushness of Day’s work supplements, rather than distracts from, the problematic grittiness of his subject matter. 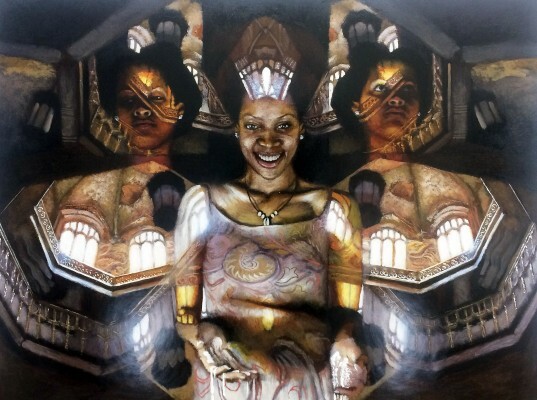 Finding visual rhymes and formal touchstones between the two artist’s pieces is one of the great pleasures of “Transitions.” Both are asserting themselves as vital voices in this epochal moment that work made in and about Detroit is experiencing. There is a fairly structured approach to cognitive development within our society—we try to make order of chaos. We assigned meanings to symbols (like letters or shapes), and organize those symbols in configurations that generate more complex meanings (like words or images), and continue along, stringing together ever-greater numbers of shapes and letters to make cogent arguments and beautiful imagery. We (hopefully) teach our young people fluency with the existing sets of shapes and letters, so they can grow up to understand all the meaning that has come before, and potentially contribute thoughts of their own to the collective understanding. Unless we don’t. The Surrealist movement, which formally emerged in Paris in the mid-1920s, supplanted the basic order of established meaning, challenging straight-line association and favoring experimentation across a wide range of media, including theater, writing, film, poetry, and of course, visual art. A survey of foundational and second-generation Surrealist art from the Museum of Contemporary Art (MCA) collection provides a vivid showcase of some of the lesser-known founders of Surrealism and those that followed in their footsteps—including a number of Chicago-based contemporary artists—and underscores the difficulty inherent in making work that disrupts the basic building blocks of meaning, as they are instilled in most of us from a young age. The work on display includes sculpture, paintings, drawings, and multi-media installations, and a wild array of subjects, rife with texture and symbols. 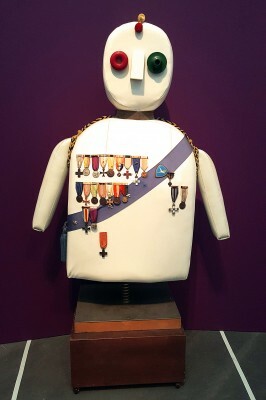 Paradoxically, the exhibition materials provided by MCA immediately attempt to contextualize and categorize some of the symbols, themes, and motifs commonly explored by Surrealists—including death, winged messengers, sleep and dreams, the grotesque, mannequins and dolls, and phantasmagoria—which to some degree undermines the destabilizing objectives of Surrealism as a movement. Again, being nonsensical, generating and/or accepting ambiguous meaning in art, is harder than it initially seems. 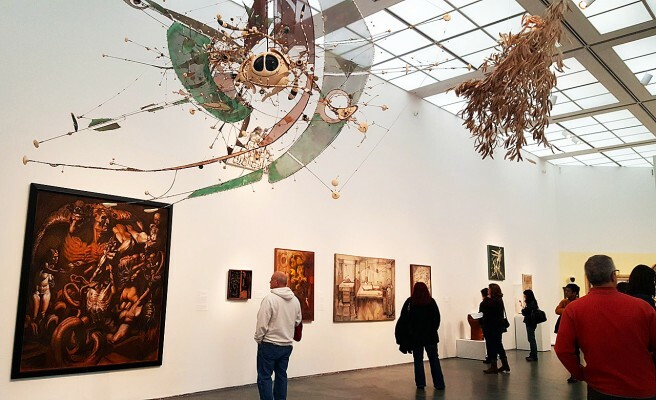 The gallery is organized into two spaces, an inner circle with rich purple walls that displays some of the movement’s foundational contributors, such as Max Ernst, René Magritte, Dorothea Tanning, Kay Sage, and Remedios Varo. There are some outstanding works here, each radically different from the next – the aesthetics of Surrealism are as disparate and personal as the individuals who worked within the movement. 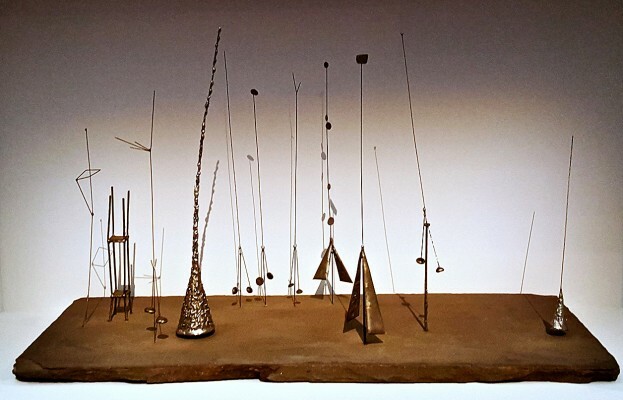 Landscape Fantasy (n.d.) by Harry Bertoia is a delicate collection of lead and wire constructions, resembling a flea circus-like playscape, on a stone slab. This minimal and understated work sits just adjacent to Punching General (1969) by Enrico Baj—an cartoonishly-shaped and upholstered military figure on a spring, designed, presumably, to act as a sparring partner for the expression of animosity toward the military state. Within a nearby patch of wall is a four-part installation by Doris Salcedo; Atrabiliarios (1993) encases shoes recovered from victims of mass violence in wall niches, stitching them in behind semi-opaque membranes that give them an otherworldly quality. Things are no less esoteric and trippy in the outer ring, which highlights Chicago-based artists that were influenced by the Surrealist movement. 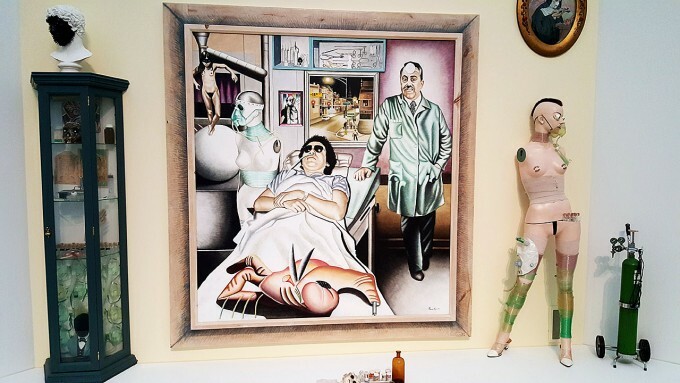 An entire wall is devoted to Marcos Raya’s disturbing installation Night Nurse (1993/96), which feels as though one of Frida Kahlo’s medical forensic paintings jumped its frame to become a department store window display. Paintings on Plexiglass suggest internal organs, literally hidden levels of processing, and highly textured paintings pile on revelations in the opposite direction—Surrealists were seemingly obsessed with abstracted notions of the body’s inner workings. 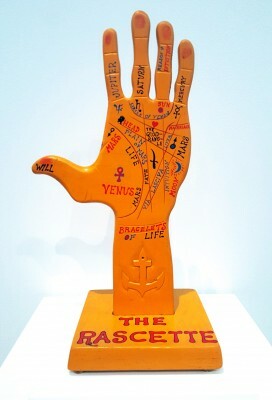 The Rascette (1961) by H.C. Westermann, attempts to highlight the secret information encoded in our very palms. A freestanding display presents a two-sided work by Henry Darger—Chicago’s much posthumously celebrated outsider artist, who spent his professional life as a hospital custodian, all the while working on an longform manuscript peppered with illustrations of kewpiesque children in various fantasy states, that is equally disturbing as it is inspired. Many contemporary artists in various media have used transcendental meditation as a method for discovering new perspectives and inspiration, and some of them—for example, filmmaker David Lynch—create work that is among the most challenging, dislocating, and original, in a field dominated by sloppy exposition and audience hand-holding. “Surrealism: The Conjured Life” presents a critical mass of work that collectively instigates a kind of dream state—surrounded by so much disordered thought, the viewer cannot help but surrender, at least temporarily, and cease to impose logic upon what she sees. For some, this may prove to be an extremely alienating experience, but for this reviewer, it is a welcome respite from the cultural spoon-feeding that is the hallmark of our media age, designed to sell consumer products, above all else. Any one of the works in the exhibition would be worthy of longer consideration, but the best effect of all is the collective disorientation. It is a very different kind of shock and awe than the political and media process used to handily to inspire fear and division among the populace; it is a confusion that inspires wondering, and with it, transcendence. As part of a national tour, No Boundaries opened at the Charles Wright Museum of African American History on January 18, 2016. The exhibition represents nine aboriginal artists from the continent of Australia who were inspired by their ancient cultural traditions. 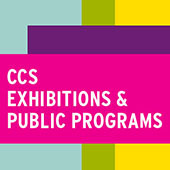 The contemporary exhibition incorporates more than 75 paintings created between 1992 and 2012. The works are drawn from the collection of Debra and Dennis Scholl, Miami-based collectors and philanthropists. 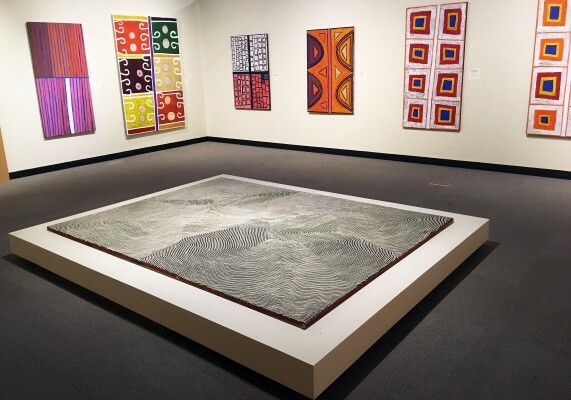 The indigenous aboriginal art of Australia has a rich history that has been studied by scholars from all parts of the world, especially the work that pre-dates the European colonization. The oldest forms are the paintings on rock in Central Australia that depict people, animals, plant life and spirituality. It is believed that Aboriginal people are the descendants of a single migration from Africa to the continent 64,000 to 75,000 years ago. All the artifacts and the earliest human remains suggest that the region now referred to as Queensland, was the single most densely populated area of pre-colonialized Australia. But this exhibition is about contemporary Aboriginal art that, according to some artists, is tied to their past. Paddy Bedford comes from Jurrawun, Australia and spoke the Gila language. His work was integral to the development of the landmark exhibition, “Blood on the Spinifex” that was held at the Ian Potter Museum at the University of Melbourne in 2002. In his artwork, he introduced a new expressionism, one that recognized the use of both positive and negative space and stark contrast. He rose to national acclaim when his images brought to memory the station massacres, because to some, they symbolized aerial maps. Paddy Bedford’s work is held in collections throughout Australia, Europe and the United States. 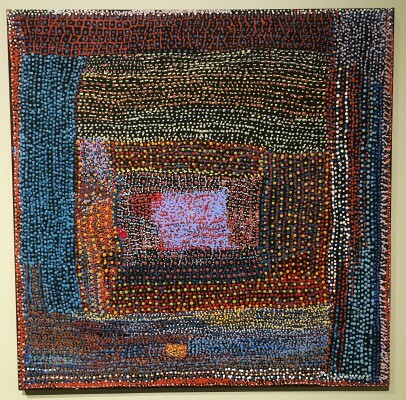 Boxer Milner began painting in the 1980s at the Warlayirti Art Center in the Wirrimanku Balgo region. Buried in his palette and restricted formal syntax is his mastery of geometry and form. These rigid structures with high-keyed colored geometric shapes offer a rare idiosyncratic iconography not seen in other aboriginal art. Rendered in a measured architecture of lines and dots, they move into a more sophisticated sense of design. 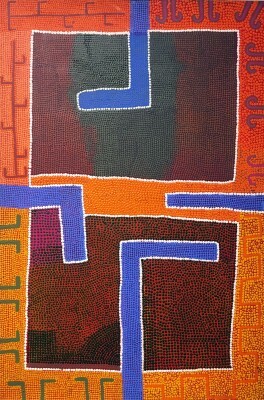 His work is part of many collections throughout Australia and at the National Gallery of Victoria. Born in the Gibson Desert near Papulankutja, Tommy Mitchel came to painting late in life. His glowing fields of overlapping dots create a patchwork of grids. Mitchel was quickly recognized as a regional talent at the Warakurna Art Centre. His graceful use of color and space take the viewer on a visual journey. He has described his work as drawing on his early life in the Ngaanyatjarra Country where he wandered as a child. His work is part of many collections, including the National Gallery of Victoria and the Art Gallery of South Wales. 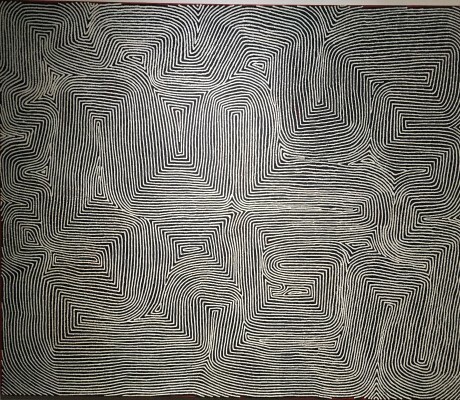 Warlimpirrnga Tjapaltjarri is originally from Lake MacKay but lived nomadically with his family in the remote western desert. He eventually settled in to paint at the Papunya Tula Art Centre. His swirling lines of dots create a pulsating field of optical intensity. Shimmering like a mirage, they invoke a shifting of movement in the desert sand, a metaphor for the energy fields while ‘Dreaming’ that runs through everything. His work is part of many collections in Australia, including the National Gallery of Australia. There is a short video as part of the exhibition, which is narrated by an art gallery owner. The cut-away shots of aboriginal people show them with little clothing and often sitting on the ground painting their dots. It caused this writer to research the history of the Aboriginal people of Australia which uncovered concerns raised by a United Nations report about unethical and discriminatory practices against Aboriginal indigenous people. Australia’s 460,000 Aborigines make up about 2 per cent of the population. They suffer higher rates of unemployment, substance abuse, and domestic violence than other Australians and have an average life expectancy of 17 years less than the rest of the country. What would be educational in this exhibition is a section that places these artists in context to the overall treatment of these native indigenous people, their heritage, cultural, traditions, and challenges in a land that was colonized by Western Europeans in the mid-1700s. I am sure this kind of national show has been vetted and follows ethical standards for procurement by the collectors. Overall, the exhibition is a very good introduction to this contemporary art movement created by a native people whose art deserves recognition around the world. This exhibit is free with museum admission. 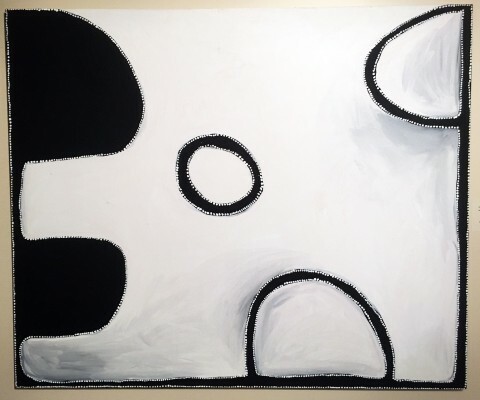 No Boundaries: Aboriginal Australian Contemporary Abstract Painting originated at the Nevada Museum of Art in Reno, Nevada and was organized by William Fox, Director, Center for Art and Environment, and scholar Henry Skerritt.